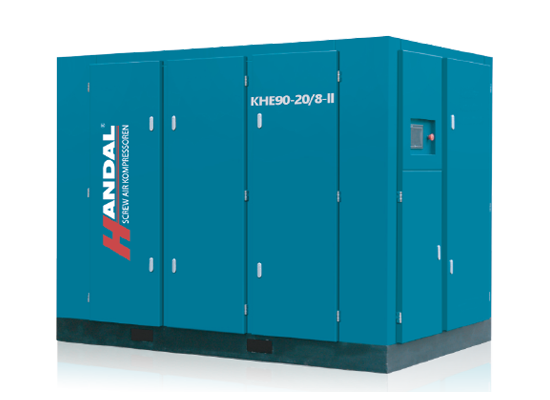 KHE Machines achieve Level 1 of energy efficiency, 15% energy-saving than level 2 and 30% energy-saving than level 3. High efficient design with new technology included. adjustable inlet design, a space for flow cooling, air/oil separator technology, high efficiency motor, smart and automatically control technology, etc.These bring you the real energy-saving. With two-stage compression and the cooling between operating stage, the compressed process is almost achieving the isothermal compression for a better performance. With water spraying curtain that is designed for cooling between operating of two-stage, the compressed process is also almost achieving isothermal compression for the best energy-saving effect.